The decision has been made to switch to a new Email Marketing Provider. Maybe you’re still looking for the new ESP or maybe you’ve signed the contract and the migration from old to new is impending—or even starting. I’d highly encourage you to take advantage of the opportunity to clean house before the move! Are you familiar with the saying, “Change the way you look at things and the things you look at will change”? It’s about the outlook and attitude when faced with a challenging situation…and migrating from one ESP to another can definitely be challenging. We can see an ESP migration as a big, huge hassle or see at as a big, huge opportunity. Take a good hard look at how you’re doing things. What’s working? What’s not? What’s working well? What’s a pain in the behind? We want to take stock and produce a list of processes and campaigns that are better off done in a new way in the new platform. Be clear and differentiate between what has been an ESP issue (and possibly the reason for switching) and what’s an internal issue. Talk to your team members and get their input too. Also talk to your boss and any other departments that either use the ESP platform or are served by your email marketing team. You might discover there’s an elephant in the room. Deal with it before you start the migration. Rather than accept same old, same old behavior, commit to improvement. While you’re doing this review of your “baggage,” also get organized in preparation for the move. Make sure to study the new platform and take advantage of any capabilities and flexibility you haven’t had before. Reorganize your campaigns and how you tag emails. Reorganize your data, fields and especially your data structures, and review your HTML to ensure it works properly in the new platform. Finally, make sure all email reporting and analytics are set up the way you need it. Taking stock and getting organized are important steps for your ESP migration, but it’s also a good time to clean house, quite literally. Definitely do list hygiene before moving! (Get list hygiene tips here.) You will want to separate active from inactive subscribers. Remember: Reactivation comes before Migration. Do a reactivation campaign ahead of time, at your current ESP. You want to do that before the move, so you can remove the truly inactive from your list (and not take that dead weight with you). Review automated and triggered emails to make sure they are up-to-date. Ditto for landing pages and subscription forms. Anything that’s out-of-date needs to be revised, replaced or rebuilt. If you’re going to be on a dedicated IP, work with your new ESP to find out if and how you can start warming up that IP, in case you can start ahead of time. View this move as a clean slate, enabling you to leave old ways of doing things behind. Even if you don’t work your way through these five steps, take some time to review what you’ve done in the past. The typical email marketer is so busy getting emails out the door, they can easily lose sight of the big picture and how well things are working (or not). Take the time to review and analyze your campaigns, look for trends and outliers. Do a data dump (if you can) so you don’t lose your historical performance. Also talk to the ESP to make sure you know what they expect of you prior to and during the migration. 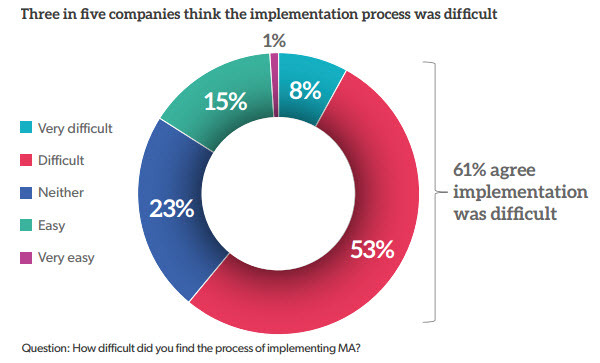 According to the Benchmarking Report Marketing automation by B2Bmarketing.net and Circle Research, 61% agree that the implementation process of Marketing Automation was difficult. Switching email service providers can be like any kind of move: a really big hassle and also an opportunity for a fresh start. Most people see a move as an opportunity for a fresh start. We get rid of stuff I no longer need, literally and figuratively cleaning house, leaving clutter behind and getting organized in the process. Admittedly not everyone does it that way. They move from one house to another and bring practically everything with them, all of the boxes full of stuff they don’t want, books they’ll never read, furniture they’ve no place for, and papers so out-of-date they could be donated to a local historical society if they had any kind of value. 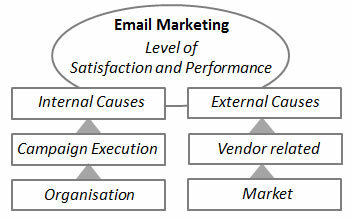 Switching Email Marketing Provider doesn’t have to be scary, although I can tell you it can be a challenge. Invest the time in making this move a real improvement process, not just in a new vendor but in new systems, processes, pieces and tools too, and in the end you’ll be much more efficient and effective at your job.